Across the U.S., the end of January and first week of February will see a decided turn to winter weather, following a mild season for many across the country. There are a few reasons for this shift — namely, a strong Sudden Stratospheric Warming (SSW) event, the warm mass of water over the northeast Pacific Ocean off the coast of the U.S., and a centrally-based El Niño signal over the Tropical Pacific. Sudden Stratospheric Warning events are marked by a rise in temperature within the stratosphere thanks to broad weather patterns in the troposphere. As these warm temperatures work down into the troposphere, upper blocking high pressure over higher latitudes increases. This forces cold air down into the southern and eastern U.S. The current SSW occurred in late December and typically takes a month or so to affect the long-range temperature pattern. The large mass of warm water in the northeastern Pacific has been affectionately named the “Warm Blob.” Much in the same way that warm waters associated with El Niño influence a broad geographic region, this mass will allow high upper-air pressure to build over this region and force cold air south into the contiguous U.S.
El Niños are typically associated with unusual warming in eastern Pacific waters off the coast of Mexico, Central America and northern South America. However, it is possible to have this warming located more centrally in the Pacific, a phenomenon called the Modoki El Niño (‘modoki’ taken from the Japanese word for ‘middle’). The Modoki El Niño creates a high frequency of troughing (low pressure) over the Eastern U.S. and allows cold air from Canada to be drawn southward into the Plains, Gulf Coast States and Atlantic Seaboard. These three features are quickly strengthening the Polar Vortex, resulting in surges of cold Canadian and Arctic air moving into the Central and Eastern U.S. over the coming weeks, with some regions likely experiencing record cold temperatures. The southern storm track will also remain strong, enhancing winter storm activity over the Southern Plains and Deep South. The next significant winter storm in the U.S. will take aim on the eastern Ohio Valley and interior Northeast late Wednesday into Thursday with a brief period of wet snow followed by some cold Canadian air, but nothing too extreme. Snowfall amounts will average from 3-6” (8-15 cm). Areas that received the most snow last week (Washington D.C. to Boston) will likely get rain. Mid-January’s major winter storm impacted the Midwest and Northeast with very heavy snow. 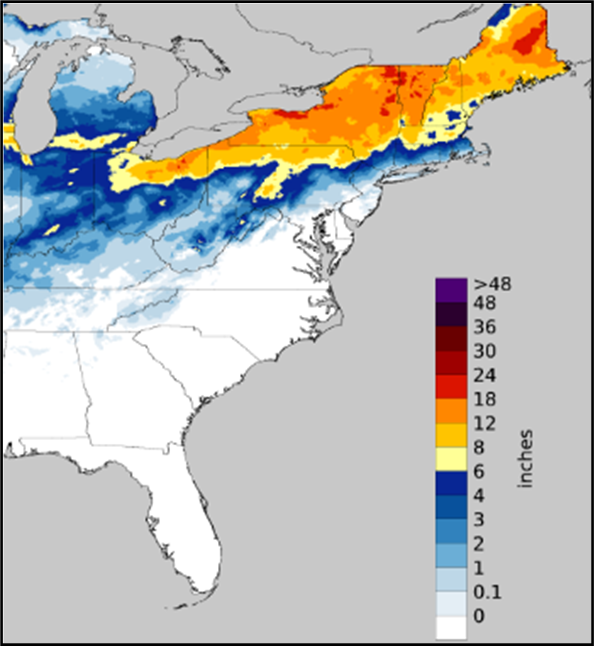 Regions from Ohio to Central New England had an average snowfall of 6-18 inches (15-45 centimeters), while areas more north (close to the Canadian border) received 18-24 inches (46-61 cm). Areas east of the Rockies, including the Deep South and East Coast, should expect extensive winter storm activity as the flow pattern slows down during the last few days of January into the first week of February. Areas as far south as the Gulf Coast could wind up with some wintry precipitation during this time-frame, along with an elevated risk for a major East Coast winter storm.